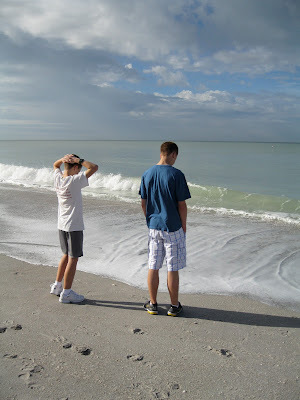 We spent Christmas down on Captiva Island, Florida. I love this photo so much I used it in a recent blog post! Now that we are back in Tennessee, it's easy to find "pretty" here, too. 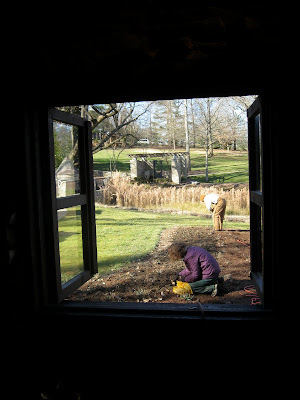 This is a shot of the groundskeepers at Cheekwood Botanical Gardens. The man in the background is drilling a series of holes every foot or so, and the woman in the foreground is putting bulbs in the ground, getting ready for spring! I've been coming down to Captiva Island almost every Christmas since I was 11. Santa Claus arrives a little differently there. Here Santa is arriving by parasail! 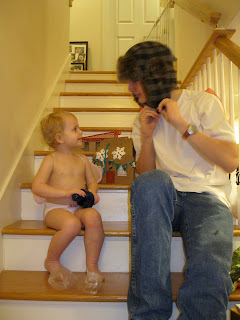 The moment big brother Tesla came home from college, Alleluia wanted him to open his presents from St. Nick. She made the gift box on the stairs behind them. I'm planning to write a post on a spontaneous toddler/preschool matching activity called, "Find the Matching Mitten." 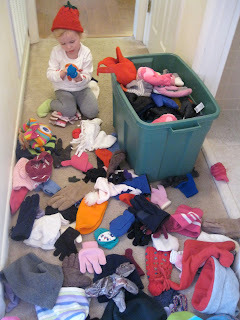 So I have actual unedited footage of Alleluia scouring our huge tub o' mittens and hats, just to find a blessed pair to wear! She had spent part of that morning's walk crying that her "hands are rotten" because they were so cold! I love how little ones describe things, like "hand are rotten". Too funny, and at the same time, very effective. 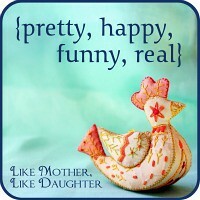 I love the 'real'. Turning it into an activity of itself really made me laugh.